At an event for her upcoming movie, Tamannaah was seen in separates from Kanika Goyal. While she looked lovely, the last min hem job was a bit of a downer. While exiting their salon session, Tamannaah and Malaika were spotted wearing Moschino, the former wearing the main label and the latter, one from the label’s capsule collection for H&M. Prefer Tamannaah’s dressed up or Malaika’s casual style? 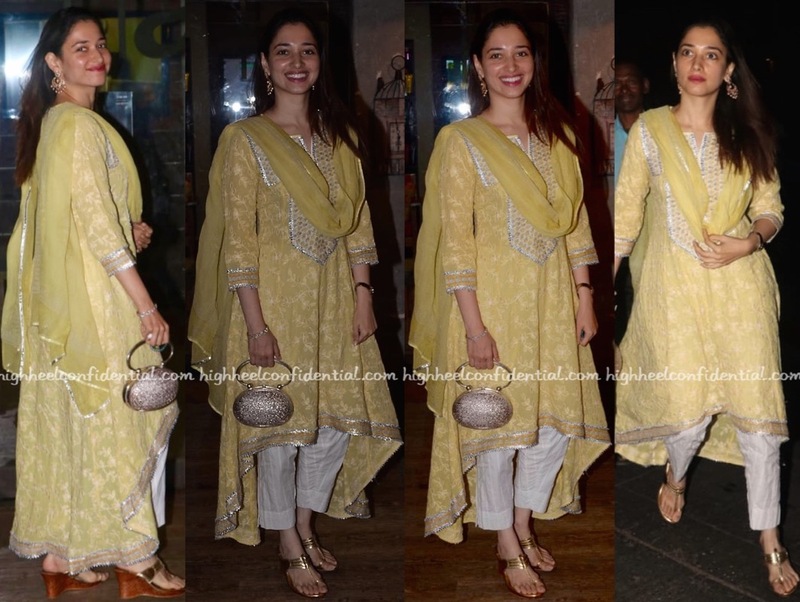 Keeping things simple in a yellow and white suit, Tamannaah was photographed as she was out in Mumbai last evening. Pair of chandbalis (earrings), a silver clutch and metallic wedges rounded out the actor’s look. The high-low kurta may not be everyone’s cup of tea but the fairly fuss-free simple look made for a welcome change of pace on these pages; Ms. Bhatia looked nice. For a recent appearance of hers, Tamannaah picked a Nadine Merabi gown to wear. With her hair swept to the side, she rounded out the look with sandals from Truffle Collection. Though the look lacked novelty, there’s no denying Tamannaah fared well in it; she wore the dress well. 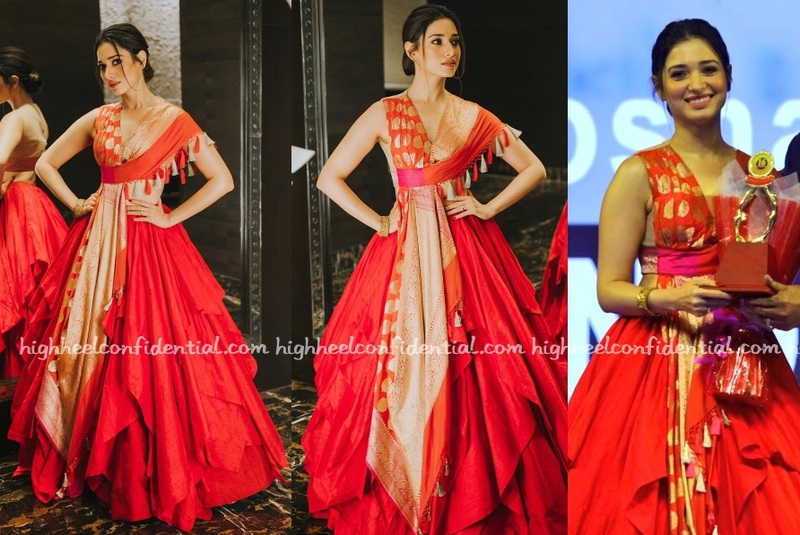 Tamannaah attended the Santhosham Awards on Sunday evening wearing a Shantanu and Nikhil gown featuring Benarasi weaves. Keeping everything else simple was a great move considering how vibrant the gown itself was. She looked great!